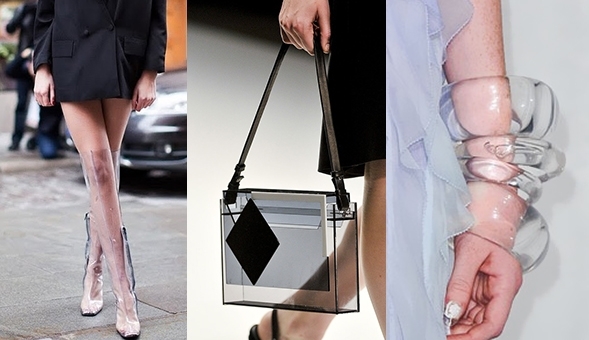 Clear is the new black and it’s this lucite acrylic accessory trend you didn’t know you needed. Most of the time when we shop for accessories, we tend to go for the gold, silver and even the occasionally dauntless colors. But have we ever thought of going transparent? Honestly, I don’t unless there is accessibility. But it’s the new color that designers are raving about and it wasn’t something I thought of investing in but I might just take up on that offer. Lucite, a solid transparent plastic made of polymethyl methacrylate. It’s scratch resistant and is the best version of acrylic on the market. Pros of the resilient clear trend? Show off in a pair of clear duster earrings, a necklace of spherical baubles or maybe with a hard shell purse. The skies the limit. But it’s the revolvable movement that’s happening in fashion; 50 shades of clear. Scroll down to see a few of this transparent concoctions. Rachel Comey Susa drop earrings, $90 at Anthropologie PHOTO: Anthropologie. Modern statement earrings, $35 at Etsy PHOTO: Etsy. Rachel Comey Orb drop earrings, $168 at Anthropologie PHOTO: Anthropologie. Laree lucite statement necklace, $58 at BaubleBar PHOTO: BaubleBar. Lucite disc drop earrings, $30 at J. Crew PHOTO: J. Crew. Tristine resin hoop earrings, $38 at BaubleBar PHOTO: BaubleBar. Confetti lucite statement earrings, $35 at Etsy PHOTO: Etsy. Lucite and crystal earrings, $65 at J. Crew PHOTO: J. Crew. So scurry on over before they sell out! Thank you for reading and Happy styling!